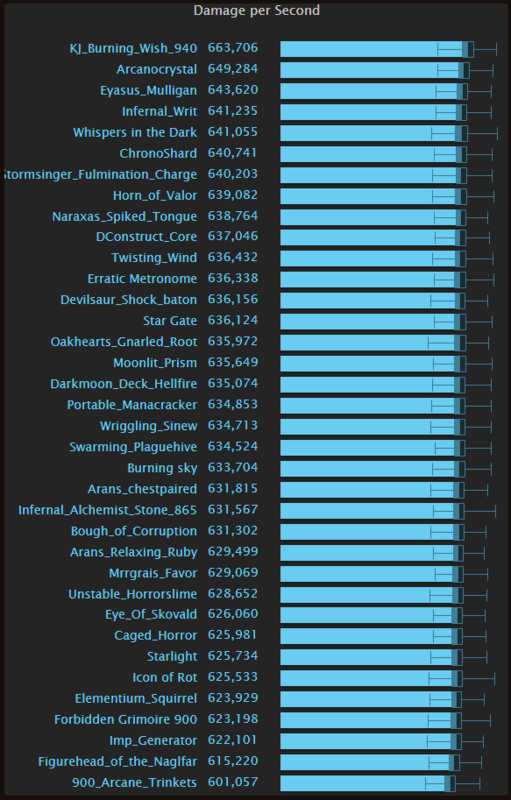 [7.2] Arcane Talents, Trinkets, Racials, Stats, Legendary - Altered Time - your #1 World of Warcraft Mage resource! Below is some basic information for people derived from SimC runs to help guide mages choices on how they want to play Arcane mage. We've moved onto T19M_NH sims. No Legendary items, 1 Concordance. Most all of this was done by Gibil/Arch/Txt/Bink. I'm just compiling their work here in a single post. Due to the number of talent combinations, these two images only shows the top performers. 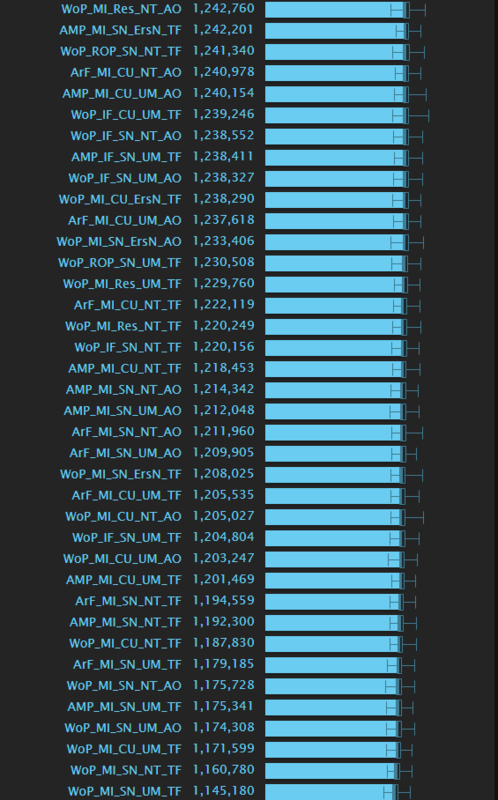 If you want to see the full HTML report, please use the dropbox link at the end of the post. if we use the highest simming talent combination we generate weights. As with Single Target, there are simply too many combinations to show them all here. So I have once again shown just the top performers. Last edited by Frosted on Mon Mar 27, 2017 7:13 pm, edited 20 times in total. First off, thanks much for the post. All that information is awesome. Second, I'll just ask the obvious- any insights into what's going on with mastery being at the bottom of the stat priority? 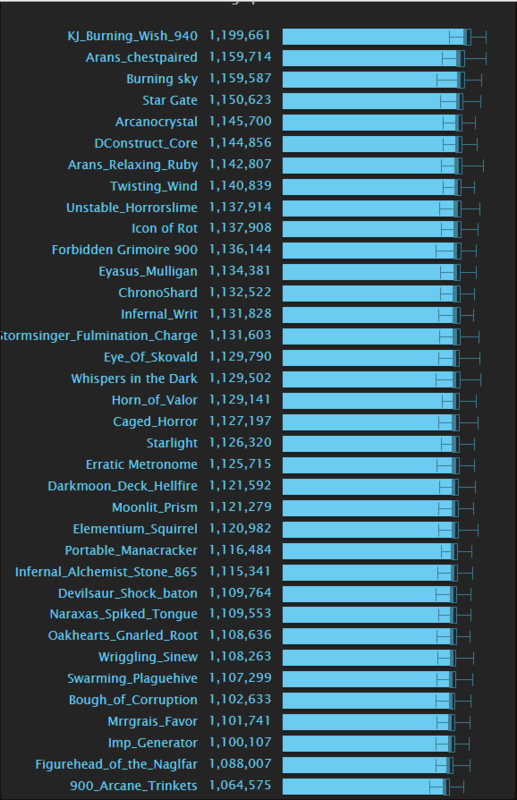 I find it even more surprising with arcane familiar at the top of its talent tier and the mystic kilt being on top of the legendaries (not that I have any real insight though). It might be worth noting that the stat weights are only a snapshot of the particular gear set that the simcraft rules restrict Frosted to sim with, which means they might not be the same on different ilevel or the same ilevel on different items. Of course one could claim the same argument for everything simmed so to be accurate one would need his own sims. An exception might be if someone did the work, and did find minuscule differences on any gear, but doubtful. I did some work to address this. 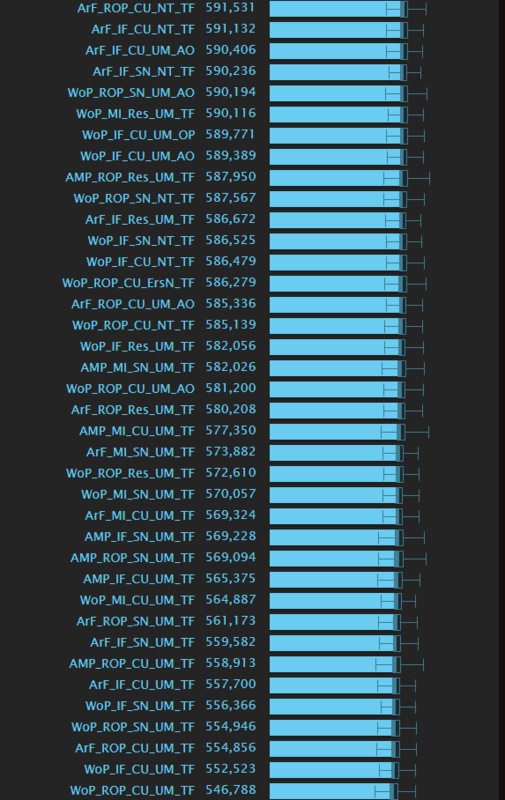 Scaled the sim to 875, and looked at mastery over a large range of rating values. Also did it with a full artifact to make sure mastery value wasn't hidden there. I'm not 100% on what's going on here. I think it's just that for the amount of regen/bonus mana you get, mastery isn't really doing anything to noticeably impact your rotation (i.e. give you more high damage spells) for the amount of rating it costs. So you're left with just 1/2 mastery scaling on the AC%dmg modifier - which is basically just a more expensive Versatility at that point. Arcane Familiar gives you a large amount of extra mana, and honestly isn't up against super strong competition. 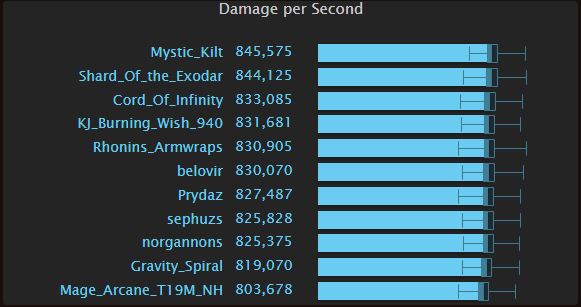 AM procs are valuable, but you're constantly dropping mana and Words of Power is only strongest at high mana. 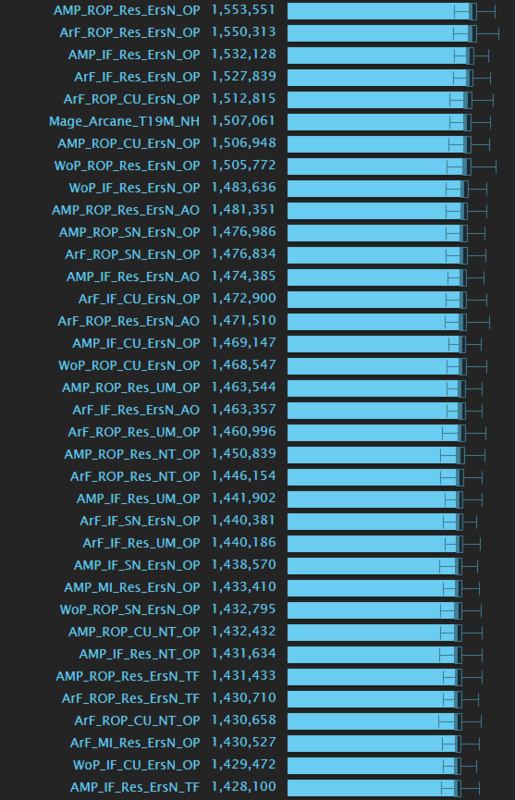 PoM doesn't actually give you more spells (it drains your mana quicker really), just lets you fit more inside AP/RoP, which is nice I guess but isn't free DPS. Arcane Familiar is free DPS from the familiar , and 10% mana that is always there. They definitely need to address mastery being such a poor stat. I think if they fixed that, Arcane and Fire could both be competitive options in Legion. I also thought the result was kind of odd, and have double/triple checked that mastery is working in the sim as it should - and it is. It doesn't explicitly try to change how it plays, no. 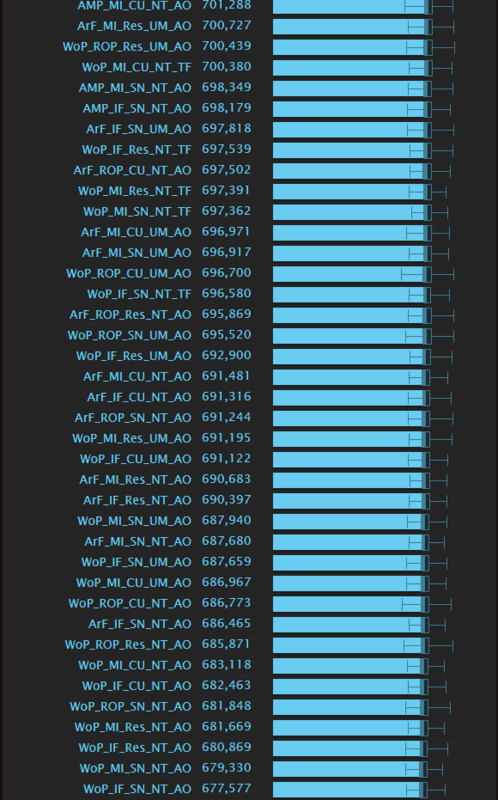 WoP could probably use some optimization in that regard - but the only thing to do really is throttle your mana use with lower AC stack Abarrs I think? It's already basically Abarring immedietly once you are 4xAC and no AM procs or other fillers to use. 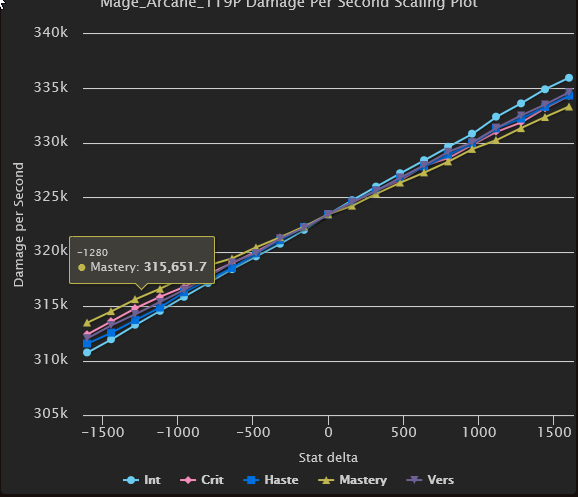 Mastery scaling is not intuitive at all. 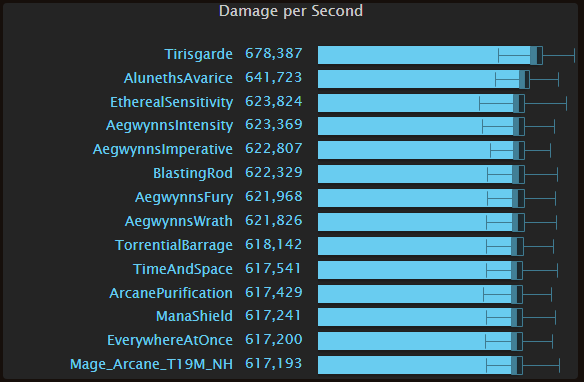 Arcane Mages rely on mana management and Arcane charges and their mastery buffs both so presumably that would be their best stat. It's pretty odd that Mastery is just a weaker Versatility right now, when both have %damage buffs..
Last edited by Mythlos on Thu Aug 25, 2016 6:30 pm, edited 1 time in total. 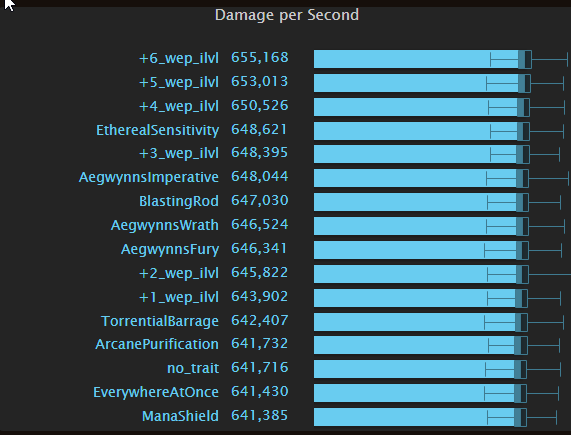 The damage potential on Aegwynn's Ascendance seems high. I haven't done any calculations myself, but the fact that it is listed dead last - even beyond Slooow Down - raises a question mark for me. It synergizes well with Shimmer + Displacement, and even if it isn't great I can't imagine it's place in that priority is best. What is the reasoning for its current position in the priority? 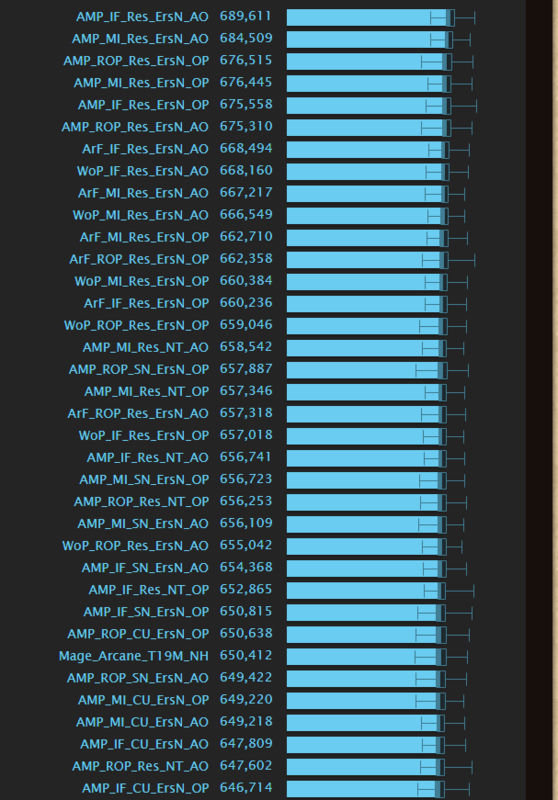 Assuming most mages are not going to want to be in melee range, or cannot be for fights. But being in relative melee ranged (14 yards) is a requirement for Arcane Mages for AOE. But even if you want to stay at ranged, using shimmer during evocation to get close, and then displacing back just after the explosion would keep you at range (apart from the moment before evocation ends) while still allowing you to use Aegwynn's Ascendance damage. It doesn't make sense and is highly unintuitive. 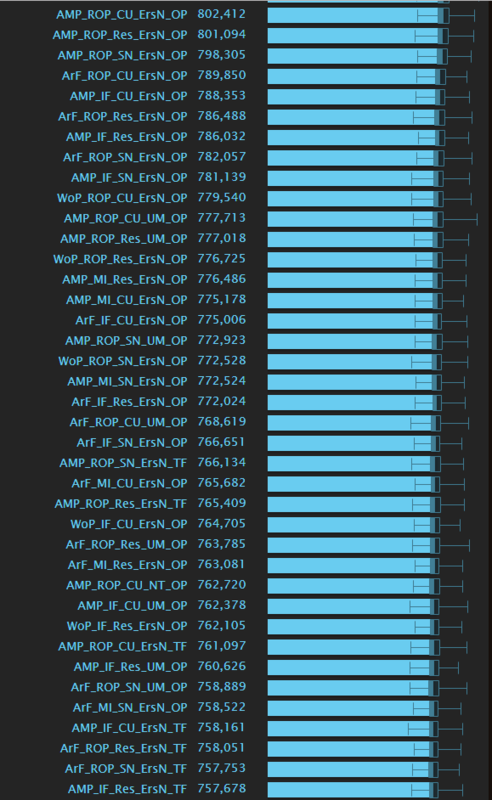 Mastery may make the spec feel smoother but it doesn't translate to DPS it seems. The designer's intention may be to keep mastery weak in order to scale mainly via intellect and to a lesser extend via secondaries in order to avoid having a spec that scales in a volatile manner with gear progression as the spec used to do in the past. In that case one could pose the question "why make mastery work that way to begin with?". Good question. In any case the spec seems left to be weak on purpose. It is unclear if it's because it was FOTM for a year or because they haven't figured it out yet mechanically or other reason. Thanks for the thoughts. That is really counter-intuitive, but you've been so thorough with these posts I figured you'd done the double/triple checking. One thing that did strike me was this rumor that Bliz was trying to make secondary stats less important, which it seems to do with arcane. The stats are so close, you could take almost any gear (or, at least, I could, as a less serious player). However, once you look at the way fire depends on crit, that argument kinda goes out the window. once you look at the way fire depends on crit, that argument kinda goes out the window. That doesn't mean it's not on their minds. They recently dropped its contribution on the main filler spells. The specs gear scaling is de facto depended on a high value for intellect to be smoother across the game because intellect is identical per gear level while secondaries fluctuate from 0 to high per item. I do agree that Bliz might still be heading towards making secondary stats less important. I was trying to point out that we have arcane that's barely dependent on secondary stats and fire that's beholden to crit. Perhaps it's a social experiment, though. Throw it to the masses and see if they like targeting gear, especially with Frosted's fire mage post suggesting you need like +40 ilvls to replace crit gear with non-crit gear in some cases. 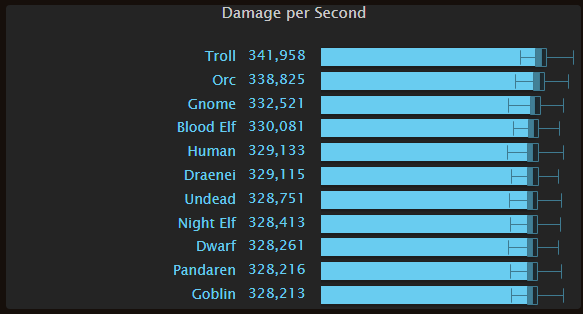 Would be interesting to see what dps is like with random gear rather than BiS. Updated for the recent changes to legendary items and trinket nerfs.